Luna has introduced a new dimension of sound meditation to the community. Her vocal-immersion sound meditation practice helps new and seasoned peace-seekers release tension, improve focus, embrace the power of mindfulness and increase creativity, energy and connectedness to self and the world around. Her offering is a cellular massage of sound that is an accessible form of meditation for all beings. 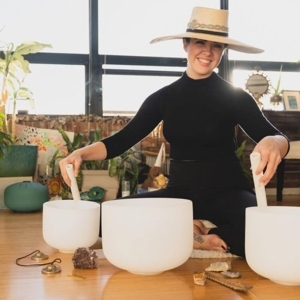 Her work with children has a heart-centered, mindful approach to meditation providing tools for children to self soothe, explore their own emotions in a safe, playful and empowering way connecting through music. In this workshop series, we will explore together how sound supports our well-being, creativity and vitality with a playful spirit. Using familiar children's songs, gentle affirmations & sonic vibrations - each child will explore how sound meditation can positively impact their emotional and physical space. Part of the Margaret S. Halloran Family Programming Series.